Trump Watch #9. Click for more. We all know just how much emphasis The Donald puts on getting out among the Real Americans, away from the Swamp, infested with Wall Street real estate tycoons. It allows him to move among the real people of The Movement. He can show the culturally oppressed white masses how much he cares for them, and it gives them the chance to shower him with the love he so desperately craves. It’s über-important. Just ask him. The Sarasota, Florida, rally today was amazing. 12,000 people chanting their love for our country. It's going to happen, this is a MOVEMENT! But is this true? Did he actually focus on Forgotten America as much as is hyped, or is he a crypto-Swamp aficionado, sticking to the big cities with the shining light of media coverage? Where and when has Donald Trump held his campaign rallies? Was there any pattern to his rally strategy? Did he (as he claims) target his campaign appearances to likely battleground states, or this just another set of alternative history from a man who credits Andrew Jackson for his peacemaking skills? Where: We took every rally or public campaign event and plotted them both over time and on a map of the US, including primary, general, post-election, and presidential campaign rallies. Yes, Trump started his 2020 campaign on 24 November 2016 and the new campaign supplied the funding for all post-election and presidential rallies. So they count. A note: crowd estimates are so varied (sometimes varying by as much as a factor of 4) that we decided to include the low estimates but did not highlight the data. When: We plotted a rolling 7-day average of the number of events held per day by Trump from campaign launch through the election and marked off the start of the official primary voting (Iowa caucuses) and a few of Trump’s major staff changes during the campaign that were likely to affect his schedule and marketing. Trump is telling the truth here. His campaign did indeed blanket battleground states, focusing particularly on the Rust Belt, Florida, North Carolina, Nevada, and Colorado. He also posted an incredibly impressive pace, particularly at the end of the campaign, peaking at almost 3.4 events per day on 7 November. Looking for the raw data? You can grab it over at our Datasets & Downloads page. The Donald logged some serious miles. It’s terrifying impressive, actually. Trump may be many things, but lazy is evidently not one of them. He had 3 days where he averaged more than 3 events/day (6-8 November, unsurprisingly). There were an additional 12 where he topped a weekly average of 2 events/day (30 October through 5 November). From the Iowa caucus (1 Feb) through Election Day, Trump had a rolling average of 1 event/day or better in 124 of the 282 days (44%). Once the primaries were wrapped up, Trump blanketed the swing states. We’ve used Cruz & Kasich’s resignations on 3 & 4 May as the point after which Trump was focusing exclusively on the General Election. The man was focused. Or his travel strategists were. Which really amounts to the same thing. 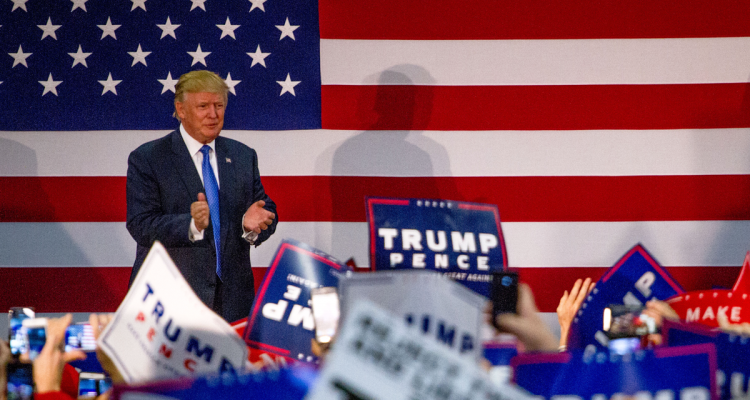 Between clinching & Election Day, Trump held 93 of his 150 events in Colorado (10), Florida (25), Michigan (6), Nevada (5), North Carolina (18), Ohio (15), Pennsylvania (14), & Wisconsin (5). Remember, this was after every one of those primaries, so these were general election rallies. In the same time period, Trump visited the non-contested states of California (5), Texas (3), Montana (1), Alabama (0), and New York (0) a combined 10 times (and CA and NY still had upcoming primaries). Trump went 6-for-8 in those key states listed above (losing Colorado and Nevada). If he goes 4-6, he probably loses the election (depending on which two additional he lost). The crowd effect (warning: wild psychological speculation!). One can easily imagine how looking out at packed crowds every day (or multiple times every day) for over a year could give Trump an over-inflated view of his own popularity. This could have feed into an already pretty narcissistic personality and possibly helps explain the refusal to believe well-established evidence about the size of the inauguration crowd or the lack of widespread voter fraud. The “Thank You” Tour feels like a campaign that wanted to consolidate its legitimacy as fast as possible through acclamation. Sure, The Donald was a busy man (and it’s really unusual to hold these kind of rallies after the election), but how unusual was he compared to his peers during the campaign? The obvious follow up to this study is to compare our Trump dashboard with campaign rally data from the other party winners from the past several elections (Cliton 2016, Obama & Romney 2012, Obama & McCain 2008, Kerry & Bush 2004, etc). The major limitation will be available information. Crowd sizes will likely be impossible to compare, so we might just have to go with “number of major events.” Even the definition of “rally” might be a bit hard to pin down. No Comments on "Mapping the pep rally president"